Orange County takes water that is flushed, rinsed, or otherwise dumped from your home, and serves it back up as drinking water. It’s real. It’s gnarly. And it’s awesome. Ponder this for a moment: we have the same amount of water on this planet as we always have. It merely moves locations and changes form. The water you use to brush your teeth was once part of an iceberg. The water you showered in this morning may be your neighbor’s old bathwater. The glass of water you drank at lunch once sat in someone else’s toilet… and we all know how we feel about toilet water. But while our planet’s water content may not have changed in millennia, the population of the human race sure has. In Southern California, the water needs of our population far outstrip our environment’s natural capacity to provide it consistently. We can’t always wait for the rain. Orange County receives an average of 13” of rainfall annually, but only received 3.6” in 2013. No, we can’t wait for the rain. Orange County sits atop a large groundwater basin, from which we draw our supply of drinking water. Being so close to the coast, our water basin has an opening to the ocean, and if we draw too much water from it (“over drafting”), the salty Pacific can make its way in and contaminate our water supply. We all use a lot of water, and the basin needs to be replenished often. 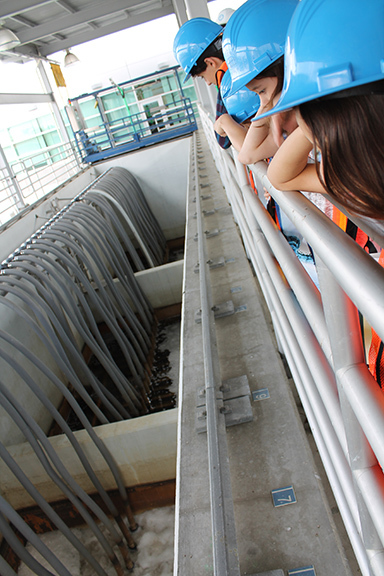 Young visitors to the GWRS watch the noisy first step of water recycling: microfiltration. 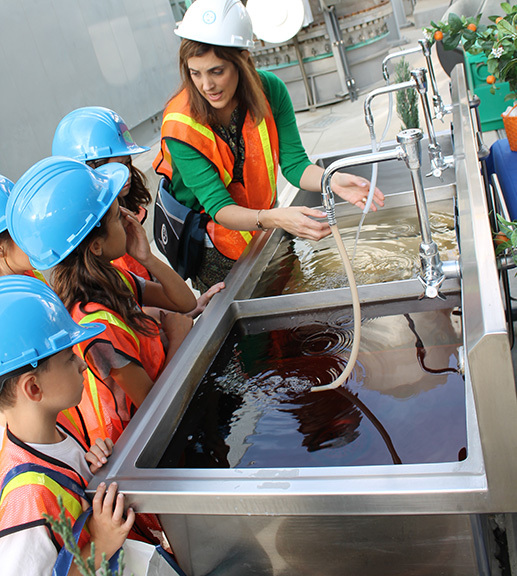 Eleanor Torres, Director of Public Affairs for OCWD, shows young visitors the different stages of water cleanliness, with the last stage pure and clean. 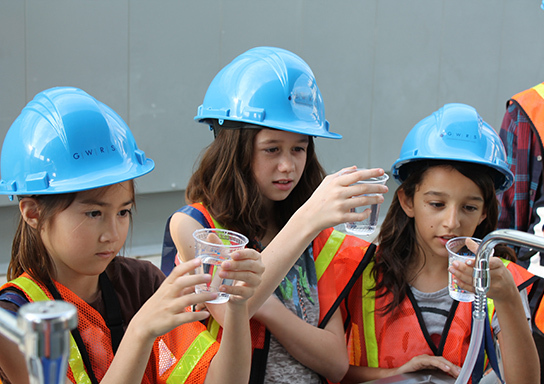 Sierra N. of Laguna Niguel, Olive S. of Orange and Bailey C. of Irvine examine the water before drinking it down. Purification is a three-step process beginning with microfiltration, where the water is pulled through hollow, plastic-like fibers. Underneath the microfiltration operation is a seemingly endless network of pipes. Local water comes from rain, storm capture, and the Santa Ana River, but that isn’t enough. We import a lot of our water from Northern California – a process that’s very expensive for us and very aggravating for many of our Northern Californian compatriots. 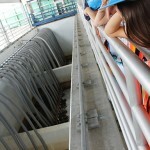 So, in Orange County, we process our sewage and turn it into drinking water. Elapsed time: 45 minutes. Turning sewage into drinking water is arguably the most controversial measure any civic leader can propose in an attempt to meet water needs. The technology has been proven for decades, but in just about every community other than Orange County it is public perception that hasn’t been successfully converted. Bordering counties, as earth conscious as they claim to be, just can’t stomach the idea. Every day, Los Angeles and San Diego continue to dump millions of gallons of reclaimable sewage water into the ocean. In Orange County, it’s different. 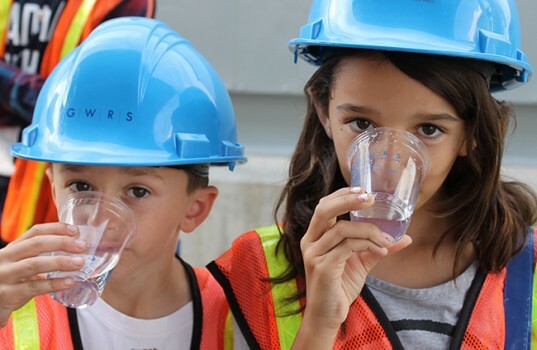 Thanks to a convergence of locally proven technology, visionary water leaders, political cooperation and concerted public relations, the Orange County Water District (OCWD), in partnership with the Orange County Sanitation District (OCSD), has been able to provide our county a real solution. 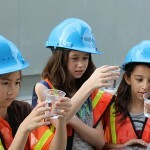 In 2006 construction was completed on the Groundwater Replenishment System (GWRS). 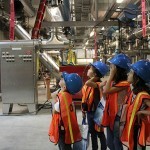 It’s the largest and most advanced facility of its kind in the entire world. 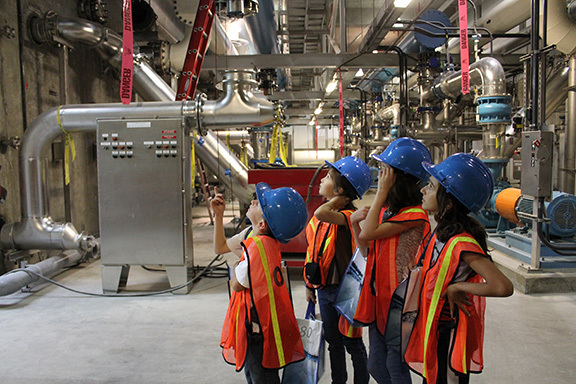 The GWRS is located right next door to the Orange County Sanitation Department, where it pulls about 60% of the Sanitation Department’s treated wastewater, equaling about 96 million gallons daily (MGD). Ordinarily, this treated water would just be discharged back into the ocean. Instead, it ultimately ends up in your glass, but not without a thorough cleansing process that transforms it into some of the purest water available. Purification is a three-step process beginning with microfiltration, where the water is pulled through hollow, plastic-like fibers. These fibers contain microscopic holes that are 0.2 microns in diameter, about 1/300 the width of a human hair, which filter out bacteria, protozoa, some viruses, and other solids. 96 MGD pass through microfiltration, losing 10 MGD in the process, which is then discharged. 86 MGD of filtered water then moves onto the next step: reverse osmosis. “Reverse osmosis is really the heart of the plant,” says Eleanor Torres, Director of Public Affairs for OCWD. It is during reverse osmosis that the microfiltered water gets pushed through a three-pass system that removes viruses, organic chemicals, and pharmaceuticals. The resulting product from this step is the purest water available, and so much so that minerals need to be added back into the water to preserve the integrity of the distribution pipes. Because of the pressurization needed in this step, it requires more energy, and about 16 MGD more is lost. The third step is disinfecting the water by exposing it to powerful ultraviolet light with hydrogen peroxide. This destroys any compounds that need to be removed to parts-per-trillion levels (an eyedropper’s worth in a football field filled with one foot of water). 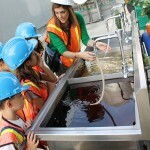 Then, the pH balance is tested to be sure that the water will neither corrode nor cause buildup in the transport pipes. So 96 million gallons of treated sewage water goes in GWRS each day, and 70 million gallons go back into the basin for drinking, cooking, bathing and, yes, re-flushing. That’s enough daily water for about 600,000 of Orange County’s three million people. That’s huge. And it’s perfectly good water that would have otherwise been sent into the ocean – wasted. Orange County is a dry area, with a limited rainfall and expected droughts three out of every ten years. Being water-wise and planning for those un-rainy days is a priority. 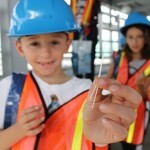 OCWD recently invested $142 million into a GWRS expansion expected to be completed in 2015. The facility’s growth will yield an additional 30 million gallons daily, taking the total to 100 million gallons daily – enough to serve 880,000 people per day. 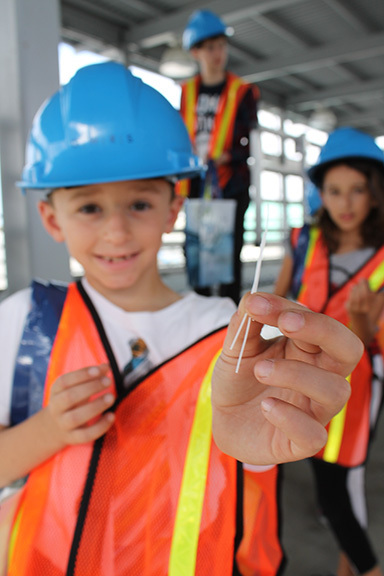 By that time, they will have also opened a mini visitor center and water education corridor to make it easier for Orange County citizens, as well as engineers and civic leaders from all over the world, to come see – and taste – the quality of their work. While Orange County leads the water-wise charge with this cutting-edge system, GWRS continues to battle the “toilet-to-tap” mentality that our neighboring counties seem to have. Alternative ideas include ocean desalination, which has been a popular topic for some time, but is very costly, extremely energy inefficient, and has detrimental effects on the environment. Crystal Nay is a freelance writer, organic seed hoarder, and mother to a hilarious and sassy miniature version of herself. She loves to learn about people by asking them things she probably shouldn't. She has never dyed her hair. Ever.